Do you dream of a bathroom that always sparkles? Want to learn how to keep your bathroom clean in 5 minutes a day? It’s easy, I promise! It may sound like a chore to clean your entire bathroom every day, but there are 4 simple steps that can become a daily habit and only take a few minutes. 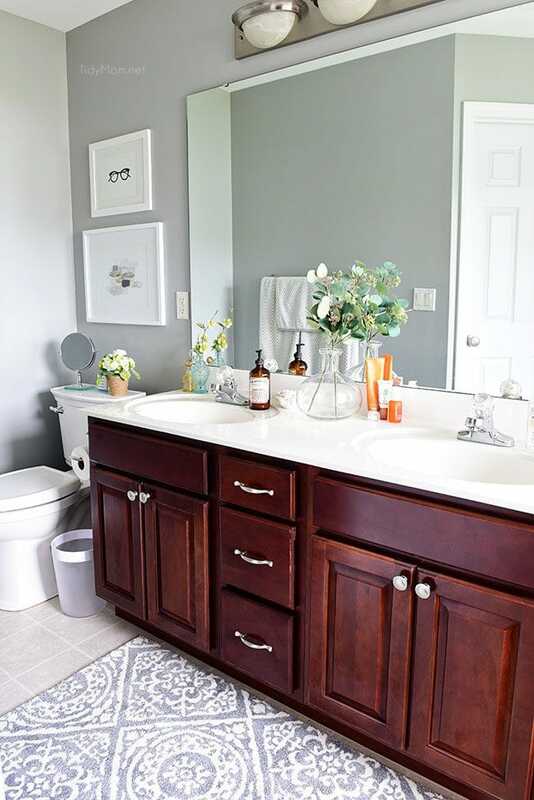 This is our master bath (we painted it Benjamin Moore Coventry Gray). You could stop by my house almost any time and our bathroom would look pretty much like this – looks clean doesn’t it? I’m a stickler for staying on-top of things. Don’t let it become a big mess and not only does it stay looking nice, but takes less time to take care of. I even followed these steps when I worked outside the home. So here’s what you can do to keep your bathroom clean in just 5 minutes a day. To be honest, some days it doesn’t even take me that long, and the days that I’m in a HUGE rush, I simply put away everything I used (brush, hair dryer, toothpaste, make-up etc) and wipe the sink and counter off! That alone can be done in just ONE minute and will make a HUGE difference! I promise!! Surface Cleaning: Spray showers with daily cleaner (right after you shower) to prevent soap scum build up. Give the counters and sink a quick wipe down to pick up rogue hairs, powder, and toothpaste. Next, wipe down the toilet tank, handle, seat, base, and the lip of toilet bowl – in that order. 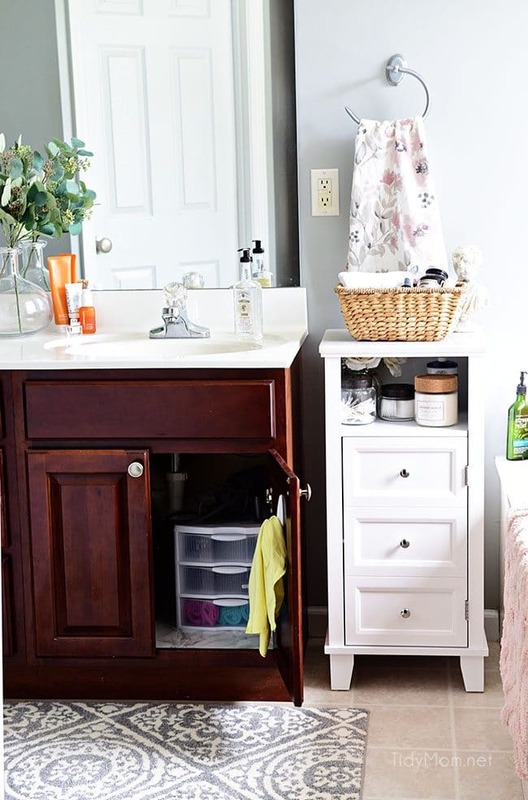 Keep a bottle of all-purpose cleaner under the vanity along with a bin of rags so everything is handy. Clean the Mirror: Keep a designated microfiber cloth under the sink for the mirror. It’s easier to get toothpaste splatter off if it doesn’t sit for days. Just lightly dampen the microfiber cloth and give the mirror a quick wipe. 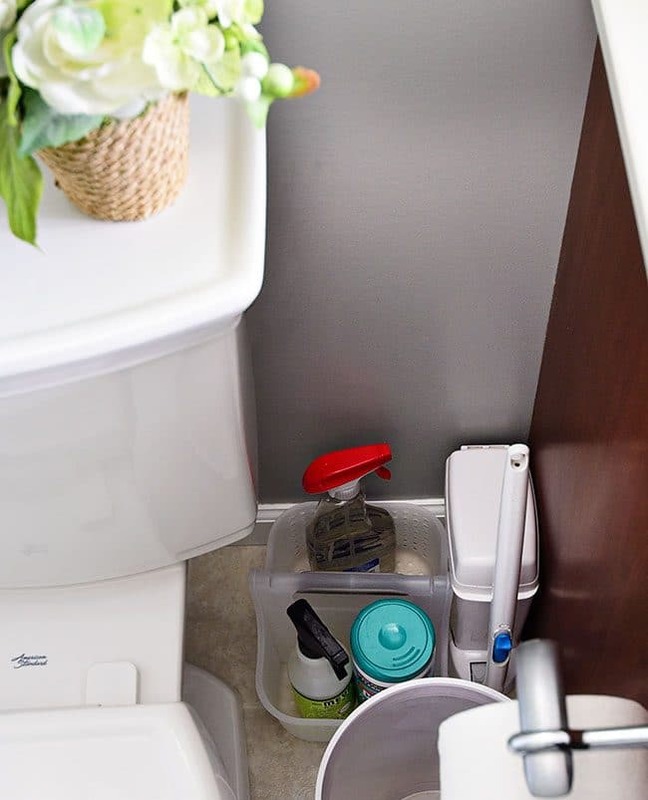 CHECK OUT HOW EASY IS TO KEEP YOUR BATHROOM CLEAN IN JUST 5 MINUTES A DAY! WATCH THE VIDEO! Once a week you can take time for a few more steps, like emptying the trash, clean the tub/shower, mop the floor. Check out my golden rules for cleaning the bathroom. 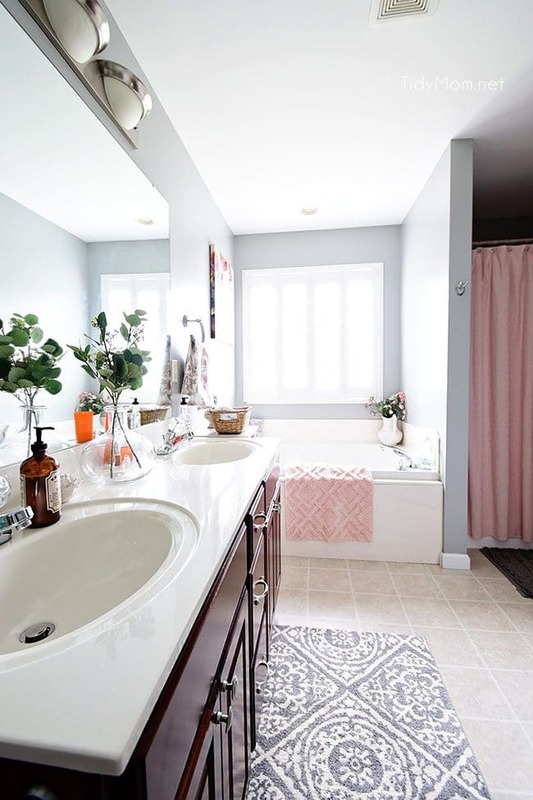 Like This Post on How To Keep Your Bathroom Clean? Pin It! Where did you get your bath rug? I love it! Oh and thanks for the helpful tips. I’ve come to the conclusion that tile IN the actual shower is HIGHLY overated. You can keep it clean easy enough- but the more you clean- the shorter life of the grout sealer… DOH! Unless I’m missing some life altering sealer. The only saving grace is that the shower floor is NOT tile. Is that a simple 3M hook thing inside the door to hang the microfiber on? That’s brilliant! Great Tips! Thank you for sharing! It makes such a big difference if you clean a little every day instead of letting it pile up! I didnt see anything about sweeping the floor or mopping it. i have curly somewhat long hair, it is everywhere i have to vac and mop all the time, what about the baseboards? A question: what cloths do you use for your daily wipe downs and what do you do with them once you are finished wiping? I don’t do laundry every day so I’ve struggled to come up with a solution for how to store dirty cloths. I’d appreciate your advice! One of the best ideas I’ve incorporated into keeping the bath clean is NO MORE BAR SOAP! That’s what causes soap scum. Switch to liquid soap exclusively, and sinks and shower will stay SO much nicer. Great advice! Norwex towels are great for this too! All you need is to dampen it and it picks up everything and even works on mirrors and to shine the hardware! I actually clean the bathroom way more often now that I have them bc it’s so fast and easy. I also usually keep a container of natural antibacterial wipes handy for quick cleaning the toilet or just wipe it down then spray with peroxide to sanitize. Is your diy drain cleaner ok for the bathtub? Is your diy drain cleaner ok to use in the bathtub? Your post is really impressive and informative. I quit using paper towels and only use cotton flour sack towels for everything. They are an easy wash, and I add bleach to clean. Thanks for sharing this great post. What multi purpose cleaner do you use? And what daily shower cleaner? OMG!!! I just can’t believe that I can make clean my bathroom in just a 5 minutes with such a beautiful cleaning hacks. Fantastic tip, thank you! I definitely need to implement it in my own bathroom. Thanks a lot for this great share! My bathroom used to be dirty despite cleaning it regularly. The blog helped me by presenting the best tips for keeping a shower clean. 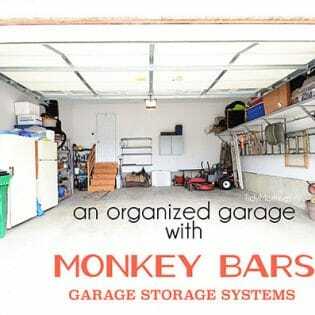 I used to keep my house spotless and that was when I had 3 kids! I even had a sister-in-law that would say I had floors clean enough to eat off of if said something to her about needing to clean the house! As I got older and remarried my husband would keep telling me that I worried too much about keeping the house clean. Me like a nut starting thinking like him and now it’s hard to get the house cleaned up the way I want it to keep it clean. After looking at this my way of doing things are definitely going to change. We are getting ready to move back into our newly renovated home! The house is empty right now. Things will be put in their proper place, all nice and clean! And it will stay that way! Thank you so much!! 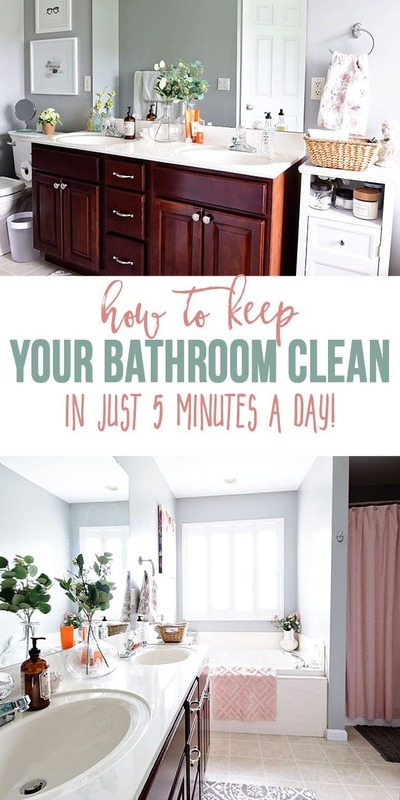 Can be cleaned only 5 minutes but I agree If I follow this rule the bathroom can be cleaned in a very short time. 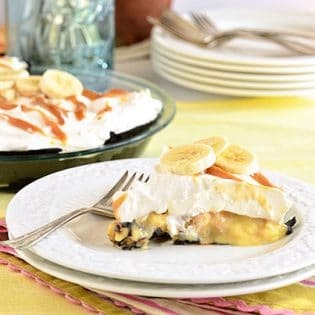 Your tips are very helpful & step by step guidelines just wonderful. Perfectly cleaning the bathroom is very difficult & time-consuming that’s why I’m very glad to get the post. Thanks for sharing the valuable article.